The Bad News is ~ Maybelline Confetti/Polka Dots Top Coat has not been launched in India yet. Infact it was not Maybelline Confetti/Polka Dots Top Coat. 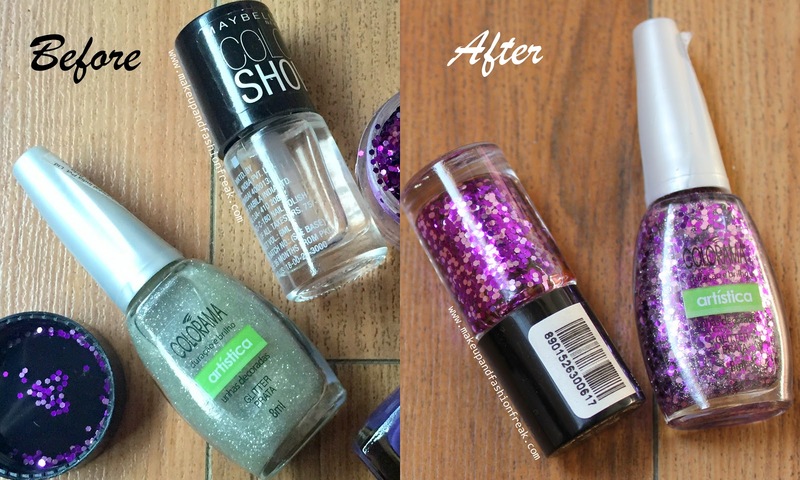 The Good News is ~ You can easily make the Confetti/Polka Dots Top Coat at home, like I did, using the below products that too for just 150. The Confetti/Glitter I have used here is, 1mm Bright Glitter- Purple Mix from a brand called N.Nail. You can buy it from kkcenterhk HERE. To make the Confetti/Polka Dots Top Coat, you just have to add the glitter/confetti to the Glitter Nail Paint/Transparent Top Coat as you require, with the help of a piece of paper. This jar makes at least 3 Top Coats. You can add a drop of any nail paint of your choice, to add color to the top coat. I skipped the step. Give the nail paint a good shake and its ready to use.